More Shorty Socks using my shorty recipe (64 cast on, 10 rows 2×2 rib, afterthought waste yarn, then stockinette forever 🙂 Used Lemonade Stand yarn in the Witch Please colorway for foot and some Cascade Heritage Sock in Iris (not lilac, I mean, it looks lilac, but it’s called Iris :)). Briar by Kat Riddel in Cotlin Harbor colorway. 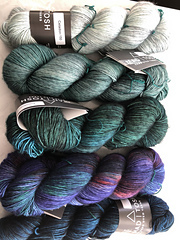 Felix Felicis by Tanis Gray in Malabrigo Rios Whales Road and Aquamarine. I’m using a US 8.